So remember how in a previous post, I showed you guys how awesome my experimental PVA glue base coat was? 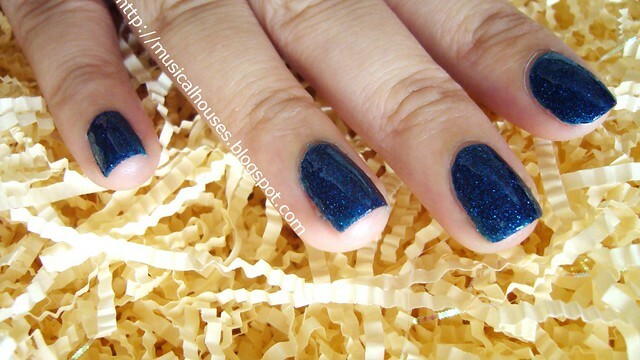 Well some of you may recall the nail polish I used for demonstrating the base coat - Nubar Night Glitter! Well I loved it so much, I decided Night Glitter needed its own post! Nubar Night Glitter isn't really the type of polish I would have bought at first glance, but I received this in a swap, and I'm glad I did! Because it looks so much more impressive on the nail than in the bottle. 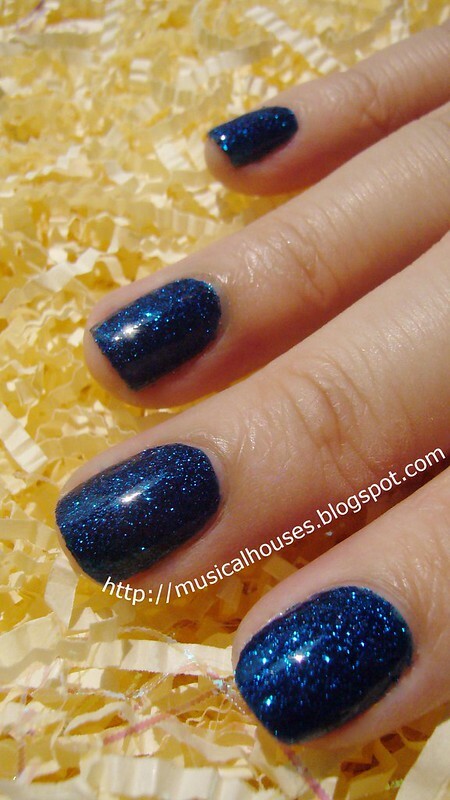 In the bottle, Night Glitter looks somewhat boring, compared to the fancy-schmamcy glitters you see nowadays. For one, all the glitter is the same shape. And size. And colour. 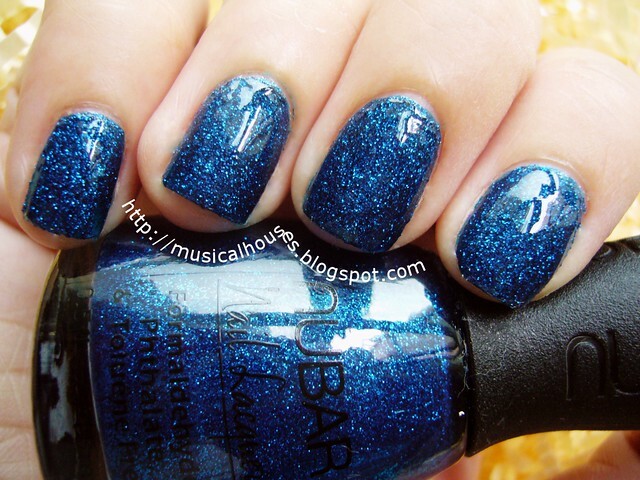 But once I painted my nails with it, I could totally see why it was the standout of the entire Nubar Sparkle collection. Because it's just so darn friggin' gorgeous. 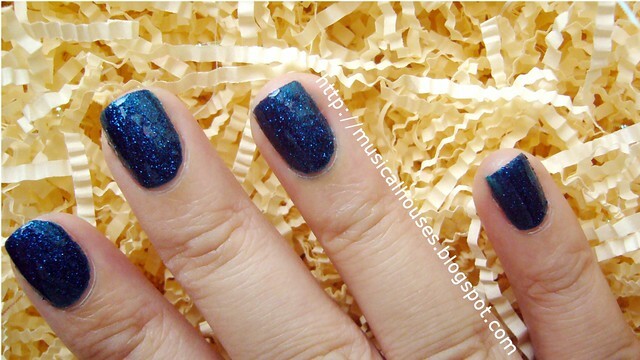 On the nail, Nubar Night Sparkle is a very pretty royal blue glitter that twinkles and sparkles like the night sky. It always looks visibly blue, and although it sparkles more in the sun, it equally beautiful in the shade. The light reflecting off the glitter is indeed a beautiful sight. It looks like a gemstone on my nails! The name Night Sparkle is quite apt in the case of this polish. Night in a gemstone. Me likey. I also didn't have any application issues. The texture was slightly thick (like most glitter polishes), but the glitter was dense enough that two costs gave good opacity, and there wasn't much glitter clumping. You don't have to layer these, I think they're really better worn alone. The best thing I love about Nubar Night Sparkle? Although it was originally released in Spring 2010, it's pretty much something you can wear year round, not just Spring. The glitter is perfect for summer days when you want some glitter that catches the sunlight and don't feel like a neon/bright shade, and the deep blue shade goes well for Fall/Winter too. And heck, it's pretty enough to wear year-round, whether you follow those colour fashion trends or not. Now let me smack myself for waiting 2 years to open my dusty bottle!